Celebrate the 15th annual Eagle Rock Music Festival on Saturday, October 5. The event takes place in the heart of Eagle Rock from 4 p.m. to 10 p.m. The free community festival features more than 35 bands playing in concert. Go Metro to save $2 on Supporter tickets and $3 on VIP tickets. Just enter the promo code GOMETROERMF when purchasing tickets online. The exclusive discount is part of Metro’s Destination Discounts program and cannot be combined with any other offers. Go Metro to participating locations and events and you’ll save on admission, get discounts on meals, and receive free gifts. Supporter tickets include exclusive digital download featuring 22 handpicked tracks from bands playing ERMF this year, and FastTrack Entrance. VIP tickets exclusive digital download featuring 22 handpicked tracks from bands playing ERMF this year, FastTrack Entrance, access to the VIP area in front of the Center Main Stage, a pair of tickets to an upcoming CFAER show, and ERMF T-Shirt. The Eagle Rock Music Festival is located on Colorado Boulevard between Eagle Rock Boulevard and Argus Drive in Eagle Rock. 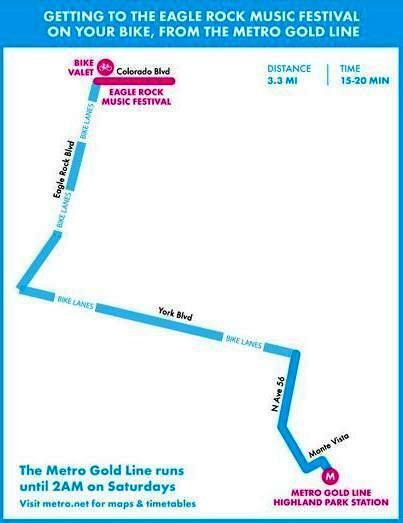 Take the Metro local 81, 84, or 180/181 to Colorado/Eagle Rock. Alternatively, ride your bike from the Gold Line Highland Park Station (see map). Bike valet will be available and bikes are allowed on all Metro buses and trains. For more routes and connections, use Trip Planner.